By Sheil Kapadia·	 10/9/2014, 10:08 a.m.
After Sunday’s win against the Rams, Chip Kelly discussed the process of feeling out opposing defenses early in games. “Just try to loosen them up,” Kelly said. “A lot of times as we play teams, it’s figuring how they decide to defend us. They were in a big man scheme, different than some of the other teams we face. Trying to get a feel for what they are going to do from a defensive standpoint. For the second week in a row, the offense looked shaky, managing two touchdown drives while turning the ball over three times. The Eagles moved the ball better than they did against the 49ers, but they were unable to sustain drives and had issues against man coverage. They got Lane Johnson back at right tackle, but were once again playing with backups Matt Tobin and David Molk at left guard and center, respectively. After the loss to San Francisco, Kelly admitted that he had to shrink his playbook with a banged-up offensive line. Against St. Louis, Kelly made some changes and tried to help out struggling QB Nick Foles and the run game. The traditional zone read has not been effective for the Eagles all season. Opposing edge defenders have consistently crashed down on LeSean McCoy and created negative plays. Against the Rams, Kelly went back to the split zone run, which calls for the tight end to come across the formation and execute a sift block on the edge defender. More often than not, that tight end is James Casey. Casey played 25 snaps on Sunday, easily a season high. He had played 33 snaps in the first four games combined. The use of the split zone has more to do with coverage than the front of opposing defenses. Here’s an example from the second quarter. The highlighted safety is responsible for Casey in man coverage. But Casey comes across the formation to block the edge defender. You can see the safety travels with him. So this is really a two-for-one scenario. Casey blocks one man and helps take the safety out of the play as well. That helps open up a hole for a 7-yard Darren Sproles run. To be fair, it’s not like the Eagles gashed the Rams on the ground with the split zone. They used it 12 times for 44 yards (3.7 YPC). But given the run game numbers in previous weeks, this was at least a bit of an improvement. If the Giants play a lot of man coverage Sunday, expect to see more split zone runs. Another issue the offense has been dealing with is predictability – opposing defenses recognizing a specific play based on formation. To combat that in the run game, the Eagles are doing a couple of different things. One is they’re having the running back switch sides right before the snap. 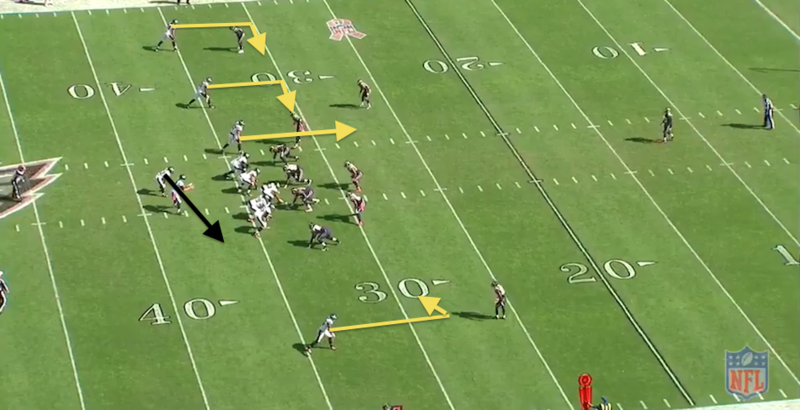 Here’s an example on a fourth-quarter run by Sproles. You can see he moves from left to right before the snap, and it messes with the middle linebacker, who takes himself out of the play and is blocked by Todd Herremans. The Eagles will also use some pistol, and as our friend Coach Flinn has pointed out, they’ll have the RB sometimes switch his steps – start out moving in the opposite direction of the play. It’s all to mess with the defense’s run fits and be less predictable. As Pat Shurmur pointed out this week, the Eagles run a lot of the same plays over and over again. Success rests on dressing them up differently and executing. There will be no drastic changes to the run game. The Eagles will try to dress it up differently and survive until they get Jason Kelce and Evan Mathis back. While there were still plenty of issues, and the Rams have not been good against the run, the offense totaled 145 yards on 33 attempts (4.4 YPC) Sunday, which seemed like a step in the right direction. We mentioned earlier that the traditional zone read has not been effective for the Eagles. Foles may keep it for a 5- or 6-yard gain on occasion, but even that is rare. And it certainly has not been enough to keep defenses honest. But Foles made a concerted effort vs. the Rams to pull the ball against bad run looks and get the ball to the perimeter. We’ve seen plenty of packaged plays with Kelly since he got here, and they’ve shown up in a lot of offenses around the league. But it looked like the Eagles unveiled a new one against St. Louis. They set up in a 3×1 look. The No. 1 and No. 2 receivers each ran 5-yard ins. The No. 3 receiver ran down the seam for a pop pass. And the backside receive ran a hitch. 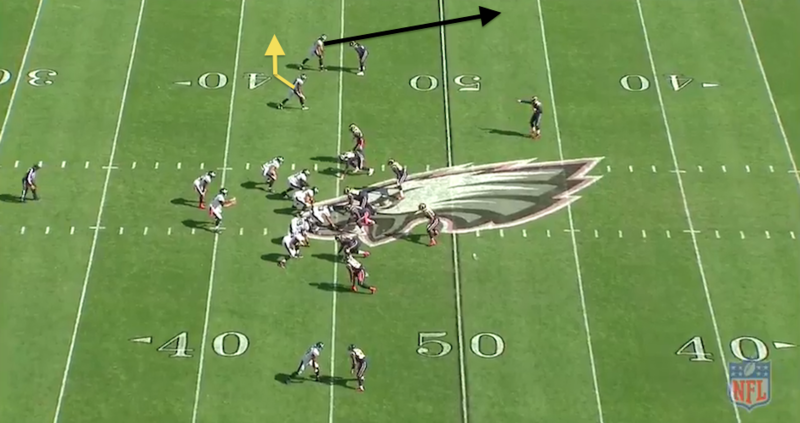 On this play, Foles can either hand the ball off for an outside zone run or pull it and find one of his receivers. Here, Matt Tobin completely whiffed on his block, and Foles was under pressure. But with the defensive back playing off, he hit Jordan Matthews for a short gain. 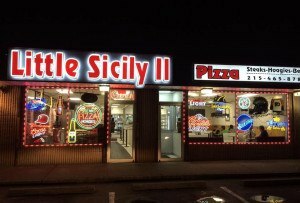 “It’s a numbers thing,” said Molk. “Too many in the box, pull the ball, throw it out there and play ball. …With what they put in the box, sometimes playing us in almost a goal-line defense, it’s really hard to run the ball. Nearly impossible. So it had to happen. Here is the same play in the red zone. This time, Foles hands it off. The Eagles ran a lot of packaged plays Sunday, and Foles’ decision-making left some room for improvement. It looked like one of those errors came early on. 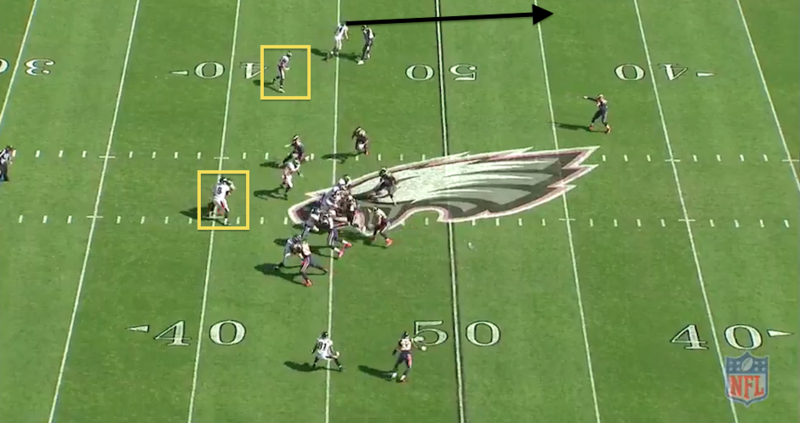 Foles had Jeremy Maclin on a bubble screen, but instead chose to hand it off against an eight-man box. The Rams did not account for Maclin in the slot. Here’s how it looked at the moment when Foles had to decide whether to pull the ball or not. 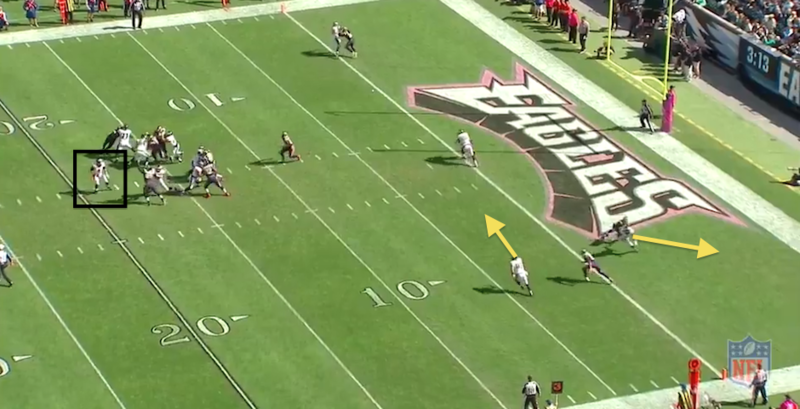 Riley Cooper faced man coverage and ran his receiver off down the sideline. Maclin would have had a chance for a big play, but Foles handed it off, Todd Herremans got tossed to the ground, and the result was a McCoy run that lost a yard. Granted, no QB is going to shoot 100 percent on these, but essentially these packaged plays are Kelly’s solution to not having a running quarterback. Given the struggles on offense, Foles needs to take advantage of any and all opportunities to pick up easy yards. The Eagles’ passing game looked very different against St. Louis than it had in the first four weeks. The game plan was for Foles to get rid of the ball quickly. There were packaged plays, screens and a lot of short throws. According to Pro Football Focus, through the first four games of the season, 23.5 percent of Foles’ throws traveled 20 yards or more from the line of scrimmage. That’s a huge number. Against St. Louis, only three of his 37 passes (8.1 percent) traveled that distance. In the past two games, Foles is 2-for-16 on deep throws (20+ yards). On the season, he’s been on-target (either catches or drops) on 31 percent of those throws. That ranks 23rd in the NFL. Last year, that number was 45.5 percent (13th). “I’ve just missed on a few. That’s it. We’ll continue to work on it, and I’ll hit some,” Foles said. Foles is also having trouble dealing with pressure. Take this first-quarter play in the red zone, for example. Foles drops back and is going to feel some pressure from his right side. Rather than step up in the pocket or shuffle to his left, he instantly backpedals, something we’ve seen on several occasions this season. Because he’s not the most athletic QB in the league, he usually ends up way behind his initial dropback spot by the time he avoids defenders. On this play, Foles ended up scrambling and throwing the ball away, even though he had Maclin one-on-one on a corner route and Brent Celek on an in route to the same side of the field. To be clear, this was not a game where Foles had a lot of wide receivers running wide open and he missed them, as we’d seen often through the first four weeks. The passing game struggled for a number of reasons. Foles once again was not sharp. The offensive line had trouble protecting. The Eagles had three turnovers. And even though the coaches talked all offseason about beating man coverage, there were definitely several instances where it looked like Foles had nowhere to go with the football. By my count, against man coverage, the Eagles completed just four passes all game that were 10 yards or more downfield – two to Zach Ertz, one to Maclin and one to Cooper. Given that the Eagles had a healthy offensive line and McCoy at the top of his game last year and still could not run the ball against the Giants, chances are it’s going to be on Foles and the passing game to do damage Sunday night.